Hunee's Daily Dish: Wire Talk: T.I. & Tiny Heading to Jail? 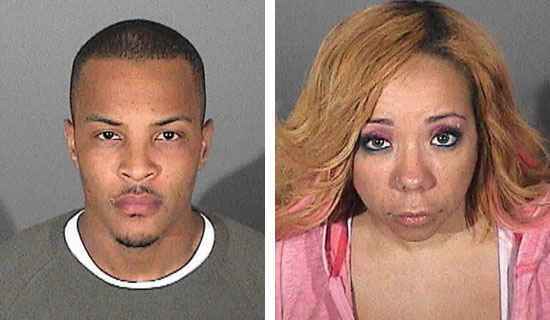 Rumor has it that Rapper Clifford “T.I.” Harris is going back to Jail to serve three years & that his wife, Tameka “Tiny” Cottle will be doing a year. According to a statement released by Atlanta U.S. Attorney Sally Yates, the self proclaimed “King Of The South,” could be going back to the place he was in just a couple of months ago. The rapper and his wife, Tameka “Tiny” Cottle could face up to a year in California state prison, after they were found with ecstasy in West Hollywood on September 1st. To make matters worse, not only did T.I. fail a drug test when traces of codeine were found in his system, but he was also traveling with a convicted felon named Cortez “C-Rod” Thomas. All infractions are violations of the terms of T.I.‘s three-year probation for attempting to purchase machine guns and silencers just before the BET Hip-HopAwards in October of 2007. MediaTakeOut.com has some SAD NEWS to report. While nothing is set in stone a person close to Tiny told us that both SHE and her new husband TI are making preparations to GO TO JAIL . . . for an EXTENDED TIME!!! WITHOUT parents for months and possibly years that we feel bad for.